Home ownership has often been seen as a key step to achieving the “American Dream.” However, until the widespread use of residential building codes in the mid-twentieth century, the standard of construction quality for the many homes built for the middle and working classes often varied. Beginning in 1922, spurred by a housing shortage following World War 1, the Better Homes Movement was begun by Marie Maloney, editor of The Delineator, and a cohort of national women’s and construction industry publications. The movement promoted homeownership, the increasing independence of the housewife to manage the maintenance, improvement, and decoration of the home, and emphasized the importance of quality design and standardized construction for new homes. The movement quickly gained support at the federal level with then Secretary of Commerce Herbert Hoover serving as chairman on the newly formed National Better Homes Advisory Council. 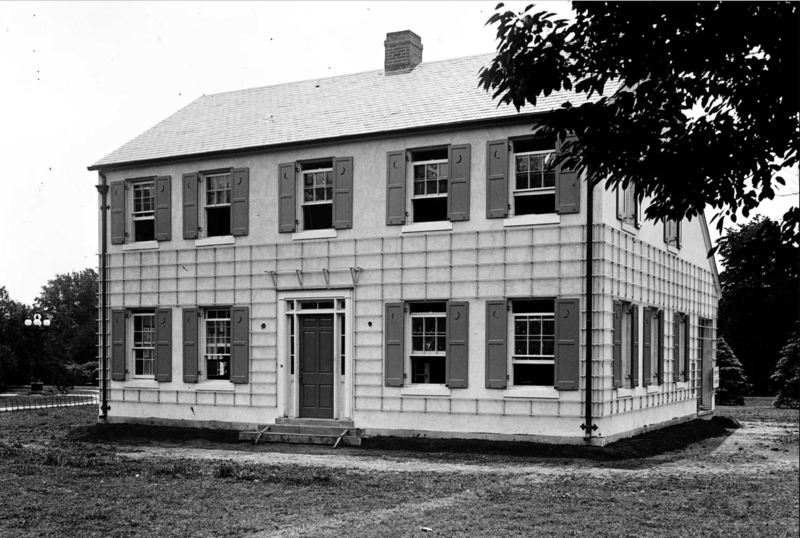 In an effort to develop an increased awareness of their goals, the council built a National Model Home on the national mall in Washington D. C. in 1923. The model home was based on the personal home of John Howard Payne, composer of song Home Sweet Home. Although it appeared traditional in design from the exterior, it was a fully modern home that emphasized efficiency of space and incorporating cutting-edge construction techniques and appliances. The national model home proved to be a huge success, with thousands of visitors touring its interior and several national publications describing its design in detail. The 1923 National Model home just before it was opened to the public. Photo courtesy of the LOC. The Homeowners Service Institute, founded in New York City in c.1920, was a proponent of the Better Homes Movement. 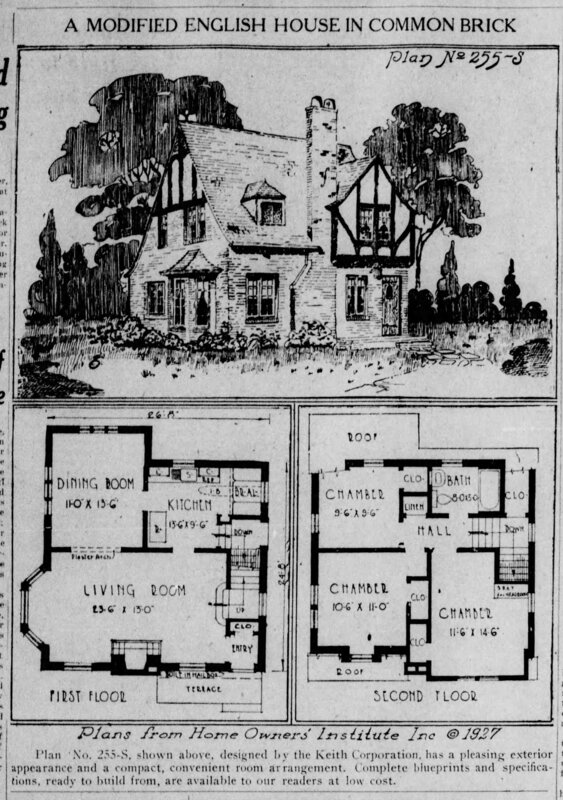 After observing the success of the National Model Home in 1923 and their own demonstration model home built with the sponsorship of the New York Herald Tribune in 1922, the Homeowners Service Institute vastly expanded their scope to include developing standards of residential design and construction, publishing a nationally syndicated weekly newspaper column, the “Small House Page” that featured a selected home design which met the institute’s standards, publishing the fourteen-volume “Own Your Home” Service Library which provided guidance on a myriad of issues pertaining to home construction and ownership, and compiling one thousand small house plans into “The Books of a Thousand Homes,” which were certified by and the working drawings sold through the institute. The Homeowners Service Institute then launched their most ambitious effort “to create the desire for and to educate the prospective homeowner to build better homes” in 1926, the National Demonstration Model Homes Campaign; also known as the Master Model Home program. The Homeowners Service Institute partnered with local newspapers in several large metropolitan areas across the United States to sponsor one or a small handful of “Master Model Homes” in their respective cities. The Institute would review and certify the drawings and specifications for the master model home to be built and would help identify and select a local builder who met the institute’s standards. The local newspaper was to provide focused coverage and documentation of the house(s) as they were being constructed, with members of the public encouraged to visit the construction site, observe the progress, and meet with an onsite representative who would explain the current construction activity. The Master Model Home program continued with increased success each year until the advent of the Great Depression. It was during the program’s second year, 1927, that the first Master Model Homes in Rochester were built and sponsored by the Democrat and Chronicle. An example of a typical Small House page. The inaugural year for the program in Rochester saw two model homes built, one in Brighton, and the other in Irondequoit. The Brighton model home was an adaptation of a design published in the Institute’s “Books of a Thousand Homes” and was built by contractor James L Garrett, whose descendants continue to build homes in our region. The Irondequoit model home was not only built by a local contractor but was also designed by his company; that person was Fred P. Tosch. Frederick Peter Tosch, born in 1890, was the youngest of son of Herman Tosch and Diane Weis. Herman was a journeyman carpenter who helped build several homes and school houses in Rochester, and fostered a lifelong career in the trade for both of his sons, Paul and Frederick. Fred did not complete high school, and began working with his father and older brother in his teens. The enterprising young Tosch, followed his brother Paul out to South Dakota in 1912, and quickly established his own electrical equipment supply business. After returning to Rochester in 1923 with his wife Beulah and young son Willis, he soon returned to his carpentry roots, founding the Fred P. Tosch Company and building a handful of modest homes on Bradburn Street in the 19th Ward Neighorhood in 1924. Mr. Tosch recognized the population boom that Rochester was undergoing and the resultant demand for housing; he leveraged his carpentry skills and experience in sales to quickly establish himself by 1926 as a well-known builder of quality homes for middle and working-class families. By the tail end of that year he began to envision a grander plan for marketing his homes to these families, and started to buy up dozens of lots in the Rogers Estates subdivision in Irondequoit. Although he began building homes on the lots that were available on streets throughout the Rogers Estates sub-division, by the spring of 1927 his vision, which was to be constructed on Wimbledon Road, began to be advertised in the local newspapers. Tosch not only exerted control over all of the homes built on the street, but also moved his family into one of the earliest houses he built in 1927. This choice allowed him to have more direct supervision over the construction of the 30+ homes on the street, but also, and more importantly, engendered a sense of trust and approachability to his prospective clients. He used his house as an informal model home and field office to help clients envision the design of their prospective homes. It was likely that his quickly rising reputation for building high-quality affordable homes and the compelling prospect of his new development on Wimbledon Road that led the Democrat and Chronicle to independently sponsor him to build a second model home during their inaugural year in 1927 despite his relative lack of experience when compared to James L Garrett. The house made use of standardized materials from national companies similar to the other Master Model Home, but also sourced many components from local Rochester manufacturers including the framing lumber and windows. The design was an iteration on Tosch’s ingenious method of modular customization, which he employed to efficiently repeat but distinguish all of the houses on Wimbledon Road. Each home he built had the same general plan but a series of set modifications including exterior cladding style, roof shape, entry vestibule location, and fireplace location, teamed with limited fully custom touches (often the design of the fireplace surround, simplified stained glass pattern in french doors and built-ins, and the front door), created the enticing product of a “custom” affordable home. The progress of building each of the Master Model Homes was reported on weekly, often with photographs, in the Sunday issue of the Democrat and Chronicle. Mr. Tosch took full advantage of this exposure, often having an advertisement for his other Wimbledon Road houses in close proximity to the weekly master model home report. A montage of several houses on Wimbledon Road exhibiting Tosch’s ingenious modular customization. Check back later this week for the second half of the article…I want to make reading this tome a little more manageable! Wow- interesting stuff! Really enjoyed. Look forward to digging in and reading more posts!